Salute to Airmail, Ltd Ed Chromium Plated Sculpture, Roy Lichtenstein - Mint! Original Limited Edition chromium plated copper mounted on black Plexiglas, 1986. Dimensions: 5.75" x 3.5" x 1.5." Edition Size: 1-50, plus proofs. Incised with artist's initials and edition number. Published by International Collectors Society. Mint Condition. Certificate of Authenticity included. Suggested Retail Gallery Price: $15,000. 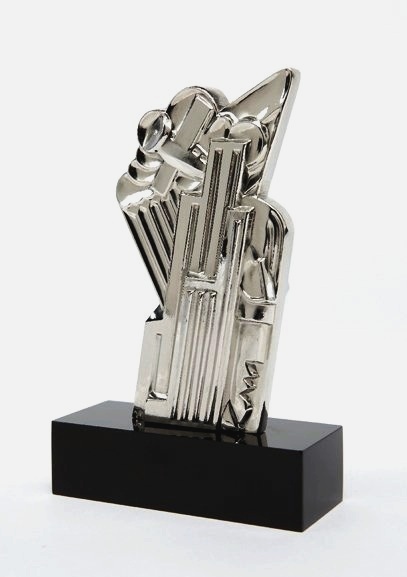 Click the button below to add the Salute to Airmail, Ltd Ed Chromium Plated Sculpture, Roy Lichtenstein - Mint! to your wish list.